The Boat Parade Viewing Party at PIER 22 marks the start of the most wonderful time of the year in Bradenton. Bradenton, Fla., Nov. 13, 2017 - PIER 22 announces its annual Boat Parade Viewing Party & Buffet scheduled to take place Saturday evening, Dec. 9, 2017. For many Palmetto and Bradenton area locals and visitors, the Manatee River Holiday Boat Parade acts as the unofficial kick-off celebration of the winter season. Boats take off from the Snead Island area promptly at dusk and make several stops along the river including in front of the PIER 22 terrace and patio dining areas. With advance reservations, attendees of the boat parade party receive reserved event seating, a glass of celebratory champagne, and tasty eats including housemade selections such as pasta primavera, carved prime rib, house salad, peel-&-eat shrimp, fresh catch, miniature desserts and much more! The procession of brightly decorated boats is due to pass by PIER 22 at roughly 8:30 p.m. The restaurant is designated as a judging stop where officials rate the vessels based on criteria like creativity, spirit, musical entertainment and crowd reaction. Audience members are encouraged to participate, and cheers from the public are given heavy weight as scoring takes place. PIER 22 marketing director Tabatha Davis called the event child-friendly and lots of fun for the entire family; she also mentioned that the event has been known to sell out well in advance and suggested that tickets be purchased before it’s too late. 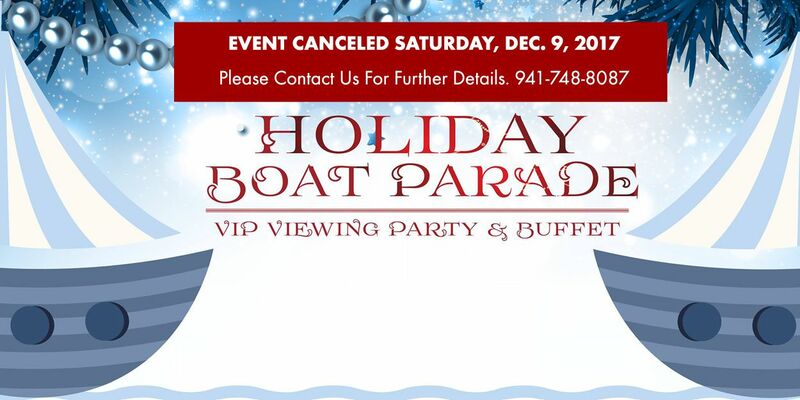 The Boat Parade Viewing Party & Buffet is a single seating event starting at 6:30 p.m. and ending with the parade finale around 10:00 p.m. Admission is priced at $69.95 for adults and $24.95 for children under 12. Due to little available seating, a limited number of reservations can be accommodated, and advance registration is required. Secure your tickets by calling the PIER 22 reservations desk at 941.748.8087. The PIER 22 menu includes Italian favorites, indulgent Southern-style dishes, delectable seafood and French-inspired fare with a diverse wine list and alcoholic beverages to match. To help make your holidays memorable, PIER 22 is open Thanksgiving, Christmas, New Year's Eve and New Year's Day with five private dining rooms as well as the renovated ballroom available with advance booking.